Dreams are important to me, especially as a habitual insomniac and as a writer. There`s tons of science behind dreams that I won`t be getting into here, but something about the ability of our mind to create images and emotions based solely upon what lies in our subconscious absolutely fascinates me. I often tell people when I dream about them. It’s a little odd, but I feel obligated, and I wish people would do the same to me. Throughout human history, cultures have regarded dreams as spiritual pathways that connect us to the supernatural. You all know I’m a pretty realistic fellow, but this is a train of thought I can actually still ride on. I’ve had my share of prophetic dreams in the past, enough to be unable to ignore the significance of the scenes that lay just beyond our eyelids. Because dreams are so important to people in the real world, shouldn’t they be just as important in the fictional world Here I`ll share a little exploration of dreams in regards to fiction. Just because you have dreams doesn’t necessarily mean you can throw them around willy-nilly. Ever wonder why you wake up feeling real emotions after a dream? What about that sensation of falling that sometimes jars us awake? Do you know why dreams often shift from one subject to the next? Why dreams are so clear the moment we wake up, but gone an hour later? This is all stuff you need to know before you start using dream sequences. Dreams do to readers what they do to us in real life: the often insert us into an alternate reality with unrealistic (well, more so than usual fiction) parameters. I often have problems with this one. When and why is your dream crucial to the story? I personally have found it a fantastic way to help the reader understand a stressful or anxious event. When was your last job interview? Exam? Review? Did you worry so much that you dreamt it the night before? I’m sure many of you will answer yes to this, and you can see how useful of a tool it is to convey anxiety, especially when the dream sequence is shockingly different than the expected outcome of the even (most likely negatively). Be mindful that you can really only use this tool once, though; any more and your character becomes a ragged mess of nerves or your narrative will seem melodramatic. On the “when” side of things, good placement is an absolute must. I won’t ever tell you how to write, but I will suggest certain truths about writing fiction, like the fact that every good reader detests a dream at the beginning of a story. The dream-beginning is a massive disappointment to a reader because you have to re-introduce the story again immediately afterward. The only time I’ve ever seen this work was Harry Potter and the Goblet of Fire, with several qualifiers: The dream was actually a premonition and a result of Harry’s connection to Voldemort, and the story was already very, very well established at that point in the series. Could Rowling have begun the series with a dream sequence? I’m sure she’d make it work, but you’ll notice she didn’t, and has now authored one of the most defining fictional works of this generation. 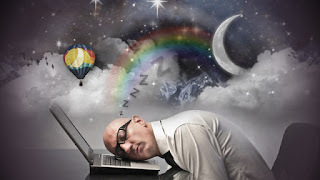 Most experts say that dreams take place in the REM portion of sleep, which means that in real-time, they only last an hour or less. Keep this in mind when writing a dream sequence; dreams may shift topic, but they never last for hours, or even days, even in dream-time. Also, be mindful of the difference between lucid and surreal dreams. How do you usually feel after a dream? Are you emotional? Frightened? Does your heart beat faster? Do you have an adrenaline rush? make sure you capture the effect of the dream on your character, because it’s often essential to the reason they dreamt in the first place. 1, Defines her anxiety as serious. 3. Defines more about the character in revealing self-doubt that would otherwise be hidden. As you can see, I used this ONE dream sequence to accomplish a variety of tasks, streamlining the narrative and allowing for the dream itself to validate its necessity in the story. Well, as always, I hope this helps you in your own endeavors! I hope to publish more writing like this in the near future, I think getting my thoughts out really helps me consider my own writing choices more carefully!